Thousands of videos are uploaded to YouTube every day. Attempting to stay on top of all that new material could be a real hassle. 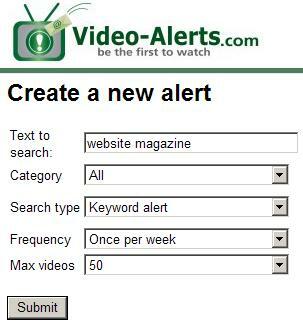 So check out Video-Alerts.com. This service will let you monitor YouTube to find when new videos have been uploaded - either by keyword or a particular user. Sign up, and you're ready to monitor. Choose your text to search, a category (or all categories), frequency of alerts and the number of results you want to see. That's it. It's a new service, so there are bound to be some bugs. But it could be a good way to keep an eye on consumer trends, your competition and to monitor your reputation on YouTube, without the need to search every time. According to their blog, Video-Alerts started because similar services (like Google Alerts) only returned results of popular videos. Video-Alerts aims to get you the latest videos fast, so you can stay on top of new developments. This also serves as a good reminder: When uploading, always tag your videos with appropriate (and far-reaching) keywords. Does it work? Yes, but it depends greatly on your keywords selection. Because the searches are not limited to "popular" videos, you can get a mixed bag. Anything related to your keywords will pop up, so you might not get exact matches.